Pastor Marvin Winans is a member of the musically gifted Winans family. He founded Perfecting Church in Detroit, Michigan, in 1989 along with a school, the Marvin L. Winans Academy of Performing Arts, in 1997. The multiple Grammy award-winning artist has recorded several albums with his brothers since the early '80s. In 2012 he preached the eulogy at Whitney Houston’s funeral in New Jersey. Pastor Winans is scheduled to be the keynote speaker at the Greater Wichita Ministerial League’s Martin Luther King Jr. event at noon today at the Wichita State University Metroplex. Carla Eckels: What are some of your reflections on Dr. King [who was assassinated on April 4, 1968]? Marvin Winans: Well, I was young, I was actually ten years old. But I will never forget. I happened to be downstairs with my mother and we had a ping pong table and so I was playing her in ping pong and my eldest brother, David, ran to the top of the stairs and yelled, he said, "Mama, they just killed Dr. King!" She ran upstairs so I followed her and it was such a time of disbelief, just more despair. As a young boy, I remember the concern. I remember my great grandmother saying, “Oh, they said as soon as they lay him in the ground, they are going to burn Memphis down!” Just all of the things that came with the shock, the awe and the disappointment of losing someone that had done so much. Then, to grow up and actually befriend his children was quite an honor. I read recently that Dr. King had a couple of spoken word albums on the Motown label there in Detroit. I just wondered about his influence on the city. You know his first "I Have A Dream Speech" [on June 23, 1963] was right here in Detroit at Cobo Hall [now named the Cobo Center]. What’s under-publicized is the fact that there were quite a few churches that didn't want to do anything with him because they felt he was a troublemaker, he was rocking the boat, he was messing with the status quo, so he really had trouble trying to get footing here in the city of Detroit. Then another familiar name, Rev. 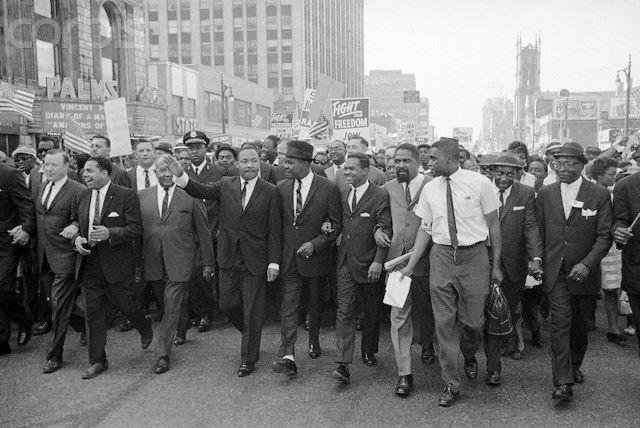 C. L. Franklin [father of Aretha Franklin], took on the mantle and they had a march, and in that march [“Detroit Walk to Freedom” on June 23, 1963] was the late [organized labor and civil rights leader] Walter Reuther and several others. That ended at Cobo Hall where he first gave the “I Have A Dream Speech”. The theme at the Wichita MLK event is unity. What are your thoughts about the importance of that in light of the government shut down and the debate about building a wall on the southern border? I think unity is important. If anything is going to be accomplished, there has to be unity. The divisiveness of today's politician and just the overall feel is that if you don't agree with me, then you must be my enemy — that is not healthy in any environment. We have to have the ability to disagree. We have to have the ability to have other opinions without vilifying the individuals that don't think like us. But no matter what it is, we have to learn how to have debate‚ have different opinions and yet maintain honor and respect for the individual. What is the one thing you want people to take away from your Martin Luther King Jr. message? Unity. There’s nothing that we cannot accomplish together. April 4, 1968: The date resonates in the hearts of many Americans, including Wichitans.